0.0.1 We all have five dominant types at five psychological levels, this is the unique philosophy of Psychosynthesis Typology. Most typologies only operate with one primary personality type and don’t consider the types of the body, emotions, mind and soul. Here is a short introduction to this fascinating thought. We all have five dominant types at five psychological levels, this is the unique philosophy of Psychosynthesis Typology. Most typologies only operate with one primary personality type and don’t consider the types of the body, emotions, mind and soul. Here is a short introduction to this fascinating thought. 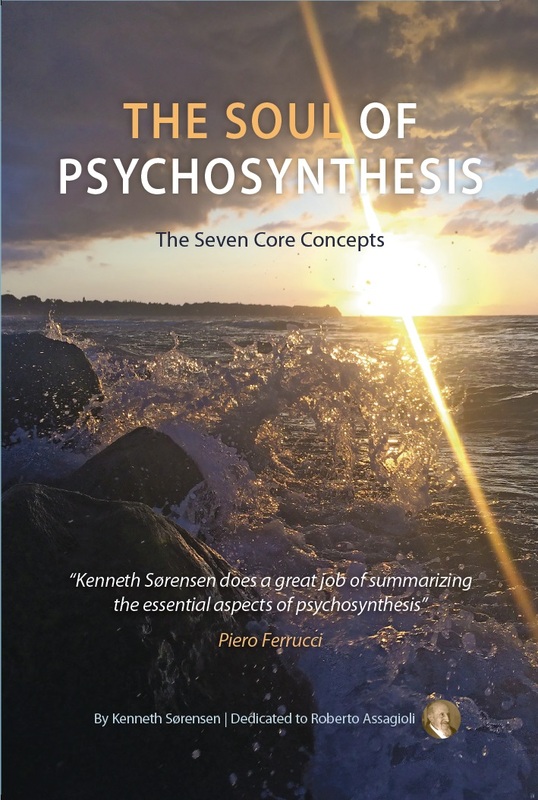 By Kenneth Sørensen, This article is an excerpt from the book The Seven Types. 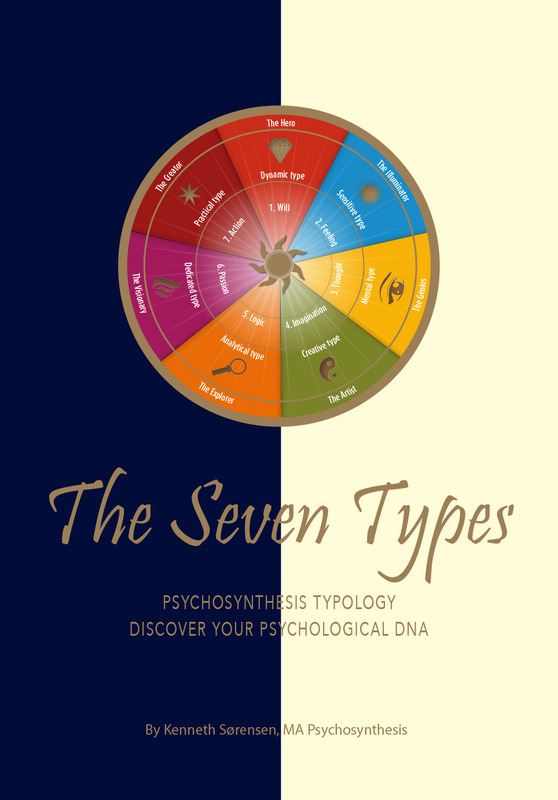 What sets the Seven Types apart from most other typological models is the insight that people are best described, not as a single type, but as a combination of five dominant types – more specifically, we each have a dominant type (one of the seven) at each of the levels of body, feeling, thought, personality and soul. That said, we will sometimes refer to people as if they were a single type. The reason for this is that while we are each a combination of dominant types at the five levels, one of these levels will tend to overshadow the others – either in a particular moment or context or generally as part of the role we are playing. Indeed, a complex interaction is constantly taking place between the dominant types – indeed, all seven types – both within and across the five levels of the psyche, as will be described below. To offer an example, in a particular individual, the dynamic type/energy might dominate at the level of body, the sensitive energy at the level of feeling, practical energy at the level of thought, dynamic energy at the level of personality, and creative energy at the level of soul. 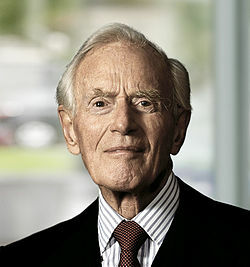 In everyday life, according to the context, a different one of these energies might tend to dominate, perhaps the sensitive energy (at the level of feeling) will dominate while the person is playing the role of parent, while the dynamic type (at the level of personality) will dominate while they are fulfilling the role of manager at work. 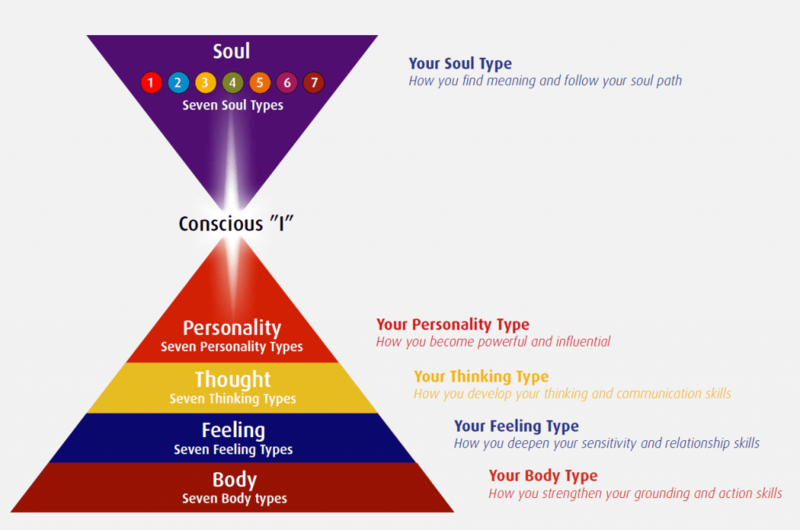 In the language of the Seven Types, we refer to a person’s dominant energy at each of the five levels as their body type, feeling type, thinking type, personality type and soul type (hence, we can say that a person is comprised of five dominant types). If the sensitive energy is dominant at the level of feeling, we would refer to this person as being a sensitive feeling type. Everyone has a dominant body type, feeling type, thinking type, personality type and soul type. At any one time, one of this set of five dominant types will tend to dominate – which explains why a person who is actually a combination of types can nevertheless appear to be a single type. As with any new language, it will take time and practice to become familiar with the words and terminology. The Seven Types is not a simplistic model, hence the language is subtle and at times complex. Let us now take a closer look at the five psychological levels. In psychological terms, the seven types operate at five different psychological levels, namely the body, the emotions, the mind, the personality and our essential soul. These same five levels were described by Assagioli in his book Psychosynthesis Typology and elsewhere. Our psyche is like a five-storey building, operating at the levels of body, emotion, mind, personality and soul; at each level, we each have a distinctive or dominant quality (one of the seven) which conditions, respectively, our physicality, temperament, mentality, personality and Soul expression. By investigating and mapping our psyche in this way, we can create a psychological formula. For example, a person might display sensitive qualities at the level of Soul, but might be a dynamic personality type, with a creative mentality, a dedicated temperament, and a practical physicality. Such a formula – which lists our dominant quality/type at each of the five levels – provides us with a comprehensive account of our typology, our own unique psychological DNA, which we can work with to actualise and express our full potential. Figure 1 illustrates how these five levels form a psychological pyramid. Also identified in the diagram is the white light of the conscious “I”, which is seeking to reconcile or integrate all five levels. So let us begin this study by looking at each of the five levels in more detail. We experience the energy and type of the body through its shape, movement and attitude. We may interpret a bent-over, slow moving body as being weak and having little energy. We may read a smooth and quick body as graceful and full of vitality. In short, there are different body types, each with their distinctive qualities. The body’s energies are most clearly recognised in the shape and contours of our face. In these two pictures we have the South African bishop Desmond Tutu and the Danish shipping magnate Arnold Mærsk McKinney-Møller. What qualities do you read in their faces? One seems open and receptive, while the other seems sharp and direct. Their faces represent two different types of energy. It is not only humans, but every physical thing radiates energy: cars, animals, houses, trees, flowers and phones each have distinctive qualities that can be observed and interpreted. We can classify these qualities according to typology and, through investigation, gain a better understanding of the characteristics of each type. Which energies we are able to observe in the world around us is affected in large part by our own typology. It is like the botanist who will see and experience a forest differently from someone who knows nothing about trees and plant life – the botanist will see an oak, ash and beech, while someone else will see only ‘trees’. The same is true of human types. Whether we can appreciate another person or object’s energetic qualities will depend upon our own typology and level of self-awareness. As well as at the physical level, we also experience energy at an emotional level, such that people can be categorised according to a set of emotional types, each with its own distinctive qualities. For example, broadly speaking, we can recognise different temperamental qualities between people from different nationalities. We read someone’s emotions through the moods they radiate. People can be calm, receptive, empathic, active, restless, domineering, and so on. We all share these basic qualities, but we do not manifest them in equal measure. By learning how to read and understand these emotional energies in ourselves and others, our emotional depth and insight will deepen, and this will help us to develop harmonious relationships with others and with ourselves. Our mental life and style of thinking also has a distinctive character. Indeed, patterns of thought and communication styles differ to such an extent that it can be difficult for us to understand each another. We are not always on the same wavelength. Some people think and speak abstractly: they are curious and enjoy exploring theories and ideas. Others are more practical and concrete in their thinking and lose interest when they have to listen to theories. A third type is associative and thinks and speaks in images and stories. Another type is dynamic, focused and goal-orientated – this type prefers to speak only when they have something important and purposeful to say. These are all examples of a person’s mentality, or unique quality of thinking. When we understand someone’s mental qualities it is easier for us to adjust and harmonise our communication. This aspect of the Seven Types is complex, reflecting the complexity of being human. When we talk about the energies of the personality, we mean the overall recognisable qualities that describe a person. Our personality emerges when as individuals we start to make our own choices and set a course for our lives. We express our personality through the quality of our will, our will-to-be-a-self. Assagioli described the formation of a strong character or personality as “personal psychosynthesis”, while Abraham Maslow called it “self-actualisation”. It is with the power of the will, alongside our other psychological functions, that we can create a successful life that meets our social, economic and career needs. When we recognise the will to be ourselves and the type of ambition we want to pursue, we can then identify the qualities we need to bring forward in our personality. Our choices in life will be influenced by the qualities we feel at home with. We may not think about these qualities consciously, but unconsciously we are tuning into resources and talents that unfold in us naturally. 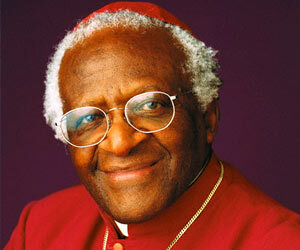 For example, some people are distinctly dynamic, sensitive, intelligent, practical or creative in their expression. A personality test – such as the personality profile at www.jivayou.com/en/ – can help us to identify the qualities we have at this level. Our personality contains the dominant energy that colours our external behaviour, meaning the manner in which we pursue our ambitions and individual way of life, with our mental, emotional and physical energies contributing their own shades and hues. We can observe that each of the Seven Types will be actualised in our life to a greater or lesser extent during the passage of normal development from childhood to mature adulthood. In this way, we move up through the pyramid (Figure 1) from the bottom up. The soul – known in many spiritual traditions and in psychosynthesis as the higher self – demonstrates a highly subtle expression of the energies. The soul contains the good, the true and the beautiful in each of us. It is the inner voice of conscience, it is inherent trust, and it contains the sense of community that we can share with other people and with the world itself. Our soul’s radiance emerges more visibly when we start to seek meaning and purpose in our lives. We intuit in our soul that we are connected to a greater whole and that we have a unique purpose in life. This purpose is about making a difference and contributing in our own way to making this world a better, more beautiful and more just place. The soul is therefore associated with the deepest and most valuable qualities we have to give to the world. This unique purpose can unfold in any walk of life; we might become leaders, thinkers, artists, researchers, networkers, journalists or creators, the list goes on. We become aware of our purpose when we start to pursue a humanistic lifestyle, then the dominant qualities at the level of soul will blend with the radiance of our personality to bring about a beautiful synthesis that combines these two dominant energies. 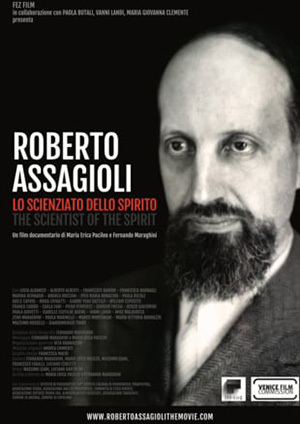 Assagioli described the development of our soul as “transpersonal psychosynthesis” and, according to psychosynthesis theory, our soul development will be influenced by one dominant energy. This means that, although we all have access to the seven energies, our soul will naturally develop in line with one particular form of energy. 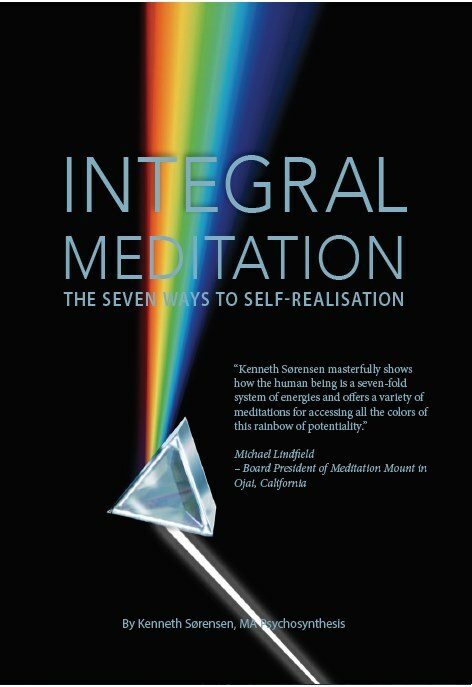 Assagioli call this The Seven Ways to Self-Realisation. This theoy is very clearly expresss and useful ! Thank you ! Your book should be translated !! !